In the sun care industry, zinc oxide (ZnO) is an increasingly popular ingredient in sunscreens and sun blocks. This is primarily due to it's status being elevated from one of a pasty white, thick cream used by crickets on their noses, to one that is less opaque and the best non-toxic choice of all the legislatively approved sunscreen ingredients. Over the years there have been many medical studies pointing to the notion that a number of the commonly used sunscreen ingredients have been shown to be potentially toxic or hazardous to humans' health. Although applied to the skin and not ingested, some studies have found that certain chemical sunscreen ingredients have the ability to become absorbed into the skin, allowing it to become present inside the human body. Where zinc oxide is concerned, it is only when micronized, or nano in size, that this is considered at all possible. As the list highlighting synthesized, chemical ingredients we should be wary of, continues to grow, the sun care industry has been forced to turn to other means of developing sunscreens with ingredients that carry a better reputation. Zinc oxide is really the top choice, with titanium dioxide the second in line, but many times a combination of the 2 is used. Both have become increasingly popular with organic or natural sun care brands. Non-toxic even for the precious coral reefs that are in such danger of disappearing. Although ZnO is able to successfully filter out both UVA and UVB rays, it has held a reputation for causing an unsightly white, chalky appearance when applied to the skin. Many people are familiar with this when used by sportsmen such as cricketers or surfers on their noses and lips. However, with the occurrence of micronized, or nano sized zinc oxide, the more modern formulations have dispelled this reputation. Newer technology has been able to reduce the size of the ZnO particles through a micronization process and although smaller in size, they are still capable of protecting the skin by reflecting the sun's rays, as opposed to absorbing and dispersing the rays as chemical sunscreens do.. This means that the actual size of the ZnO particles are small enough that it won't leave a white residue on the skin but is still potent enough to protect the skin from ultraviolet and free radical damage. The graphic representation above shows just how effective as a sunscreen ingredient. Besides this, Zinc Oxide is known as a much safer and more effective sunscreen than Titanium Dioxide based on physical chemistry and biological effects. 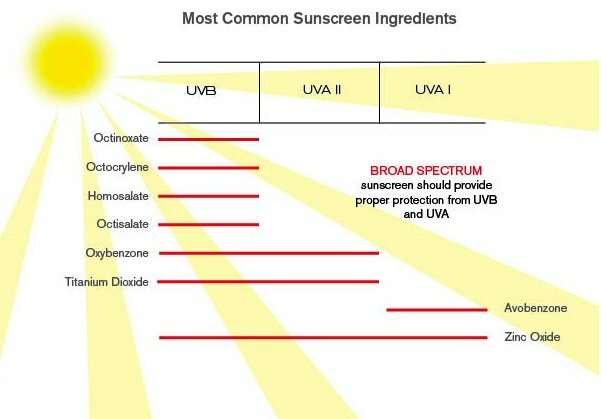 As illustrated, zinc oxide’s UV absorption spectrum is far more broad in spectrum for both UVA and UVB rays. Titanium Dioxide creates more free radicals, which create oxidative damage to your body and skin cells, increasing the aging processes and exposure to skin cancer. Zinc Oxide is the only sunscreen active ingredient that’s been tested and FDA approved for use on babies under 6 months of age and children, illustrating its high degree of safety. However, it is standard practice across the globe to recommend all babies under 6 months of age avoid direct exposure to the sun. 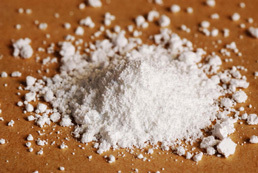 Titanium Dioxide does not play any natural role inside the human body. Zinc on the other hand, is a critical mineral nutrient that keeps us healthy. Zinc oxide is also considered to be an effective sunscreen that is less harmful to coral reefs than sunscreens that include chemicals such as oxybenzone and octinoxate.